The LS-14 Linear PCM Recorder from Olympus is designed as an all-in-one, professional and portable recording solution. It has built-in stereo directional microphones as well as an omni pattern center microphone. This three microphone array is designed to effectively capture lower bass ranges and deliver high fidelity recordings. 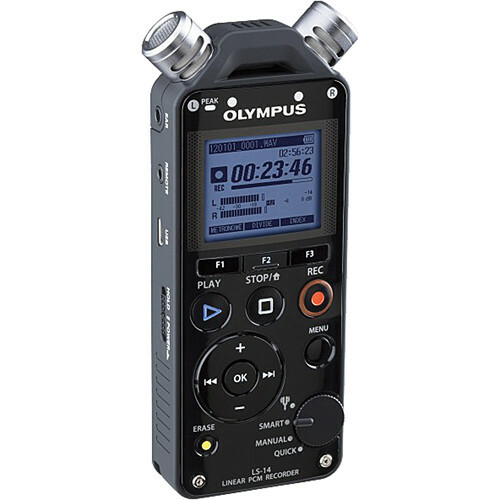 In addition to the internal mics, there are 3.5mm stereo mini-jack mic and line inputs for connecting external audio equipment such as microphones or CD players. There is also a USB port for interfacing with your computer. The LS-14 records at a maximum bit depth of 24-bit and a maximum sample rate of 96 kHz. Also, in addition to PCM (WAV) recording, it supports MP3 file formats. There's also convenient features for musicians included such as a built-in metronome and tuner as well as overdubbing and a pre-recording function. Further, you can find important moments in your recordings by using the index mark feature. In terms of storage, the LS-14 is equipped with 4GB of internal memory and also features a micro SD slot. The LS-14 also comes with a "clip stand" for clipping to a microphone stand or setting on a table, as well as a carrying case. Included clip stand works with the tripod hole on the back of the device and allows the device to be clipped directly to a microphone stand or displayed on a table, reducing surface noise.